1. 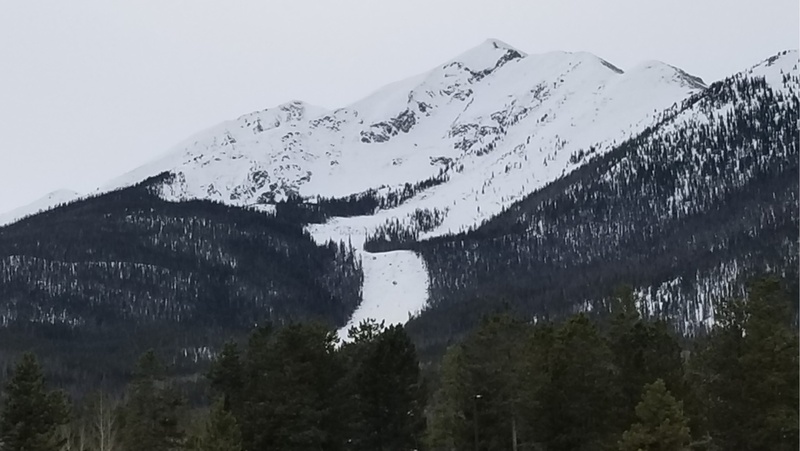 You may have seen on the news all the avalanches here in early March, shutting down the Interstate and several ski areas multiple times over the course of a week. Cars were buried and several backcountry deaths occurred. This was a storm pattern of unusual proportions. Some places reported two feet in a matter of hours. All told the Colorado Avalanche Information Center reported 302 avalanches across the state from February 28th to March 8th. There was even an inbounds avalanche on a run in Imperial Bowl, no one was hurt. That picture is of a massive new slide created below Peak 1. 2. Our much maligned Troll has found a new home. The work of art by Danish artist Thomas Dambo was originally built on the Wellington trail adjacent a neighborhood. The response was so overwhelming, with thousands of people coming to see him, that the locals were inundated. Parking, noise and trespassing became an issue so the Troll was removed. The new home will be about 200 yards back into the woods near the Ice Rink. A new trail will be built so as not to interfere with the existing popular trail. The Ice Rink has parking and shuttle service so hopefully this will alleviate previous issues and our local Troll can hang peacefully in the Breckenridge forest for many years. Please come visit him, he's a people troll. 3. Another record breaker for Mikaela Shiffrin. She recently broke the record for world cup wins in a season with her fifteenth victory. Winning the slalom in Spindleruv Mlyn, Czech Republic pushed her over the top before her 24th birthday. Vreni Scheider set the record in 88-89 before Mikaela was even born. At such a young age she is sure to break all the records before she is done. 4. Believe it or not it’s time to think about your 2019-2020 ski pass. Vail has announced it’s Epic Pass, which covers Breckenridge, prices; $939 for the Epic and $699 for the Epic Local. Go to Snow.com to purchase. Put $49 down before April 15 and this will protect this price and give you 10 buddy tickets you can purchase with your pass. If you purchased a day lift ticket this year you may apply that value to the purchase of an Epic pass for next season. When I bought my first season pass it was only good at Breckenridge. Now with the purchase of your Epic Pass you can ski all over the west, the Midwest, Canada, Japan and Europe. Like I say, it just keeps getting better!